Say "infrastructure" and most people think roads and bridges, not tubes and valves. But to Bill Mook, the black box in the basement of his oyster hatchery is every bit as fundamental as the basic facilities and structures that serve as a community's framework. Mook, who started Mook Sea Farm 36 years ago, raises millions of tiny seed oysters for growers along the East Coast, as well as full-grown oysters for shops and restaurants. At the end of the last decade, he started having severe problems growing larvae in the hatchery, and after consulting with West Coast peers who had experienced similar trouble, figured out the problem: ocean acidification. Greenhouse gas emissions blamed for global warming also are making the ocean more acidic, which interferes with the ability of oysters to build strong shells. That could carry implications for other species such as clams, scallops and the all-important lobster, which alone accounts for more than 90 percent of Maine's $534 million shellfish industry. 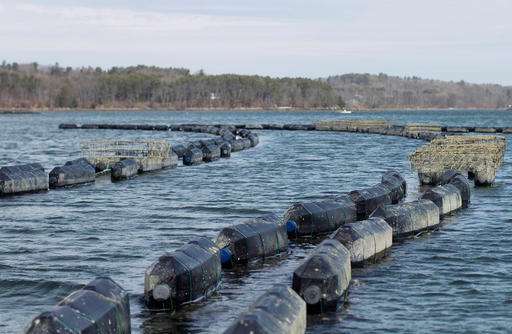 "It ultimately could spell disaster for the shellfish industry," Mook said. "Hatcheries are really the canaries in the coal mine, so what we view as our job right now is sounding the alarm and getting more people concerned about the problem." 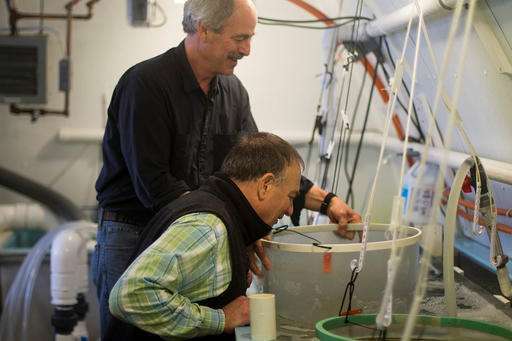 Joe Salisbury, an associate professor of oceanography at the University of New Hampshire, installed a monitoring system at Mook's hatchery to measure the carbon dioxide, temperature, salinity and other variables in the sea water coming into the hatchery. That allows the hatchery staff to make adjustments that take those measurements into account and give the larvae a better shot at developing into healthy oysters. The monitoring system also could help researchers get a better picture of how water coming off the land—via lawn treatment products and discharge from water treatment plants—is contributing to acidification, Salisbury said. "There's a fraction of ocean acidification near the coast that we might be able to remediate," he said. "It will take years to bring down the carbon dioxide levels in the atmosphere, but this is something we could turn the switch on." 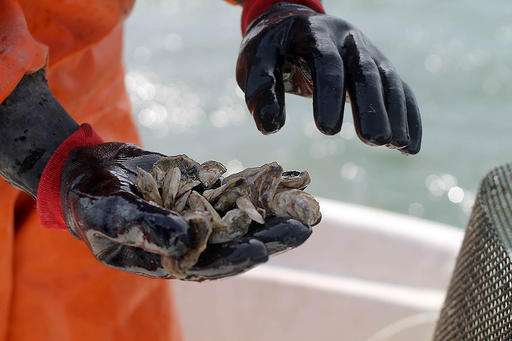 If there's any silver lining to the situation, Salisbury said, it's that it could spur growth in new aquaculture ventures, such as farm-raised scallops or even lobsters—because the acidification problem affects shellfish when they're very young. 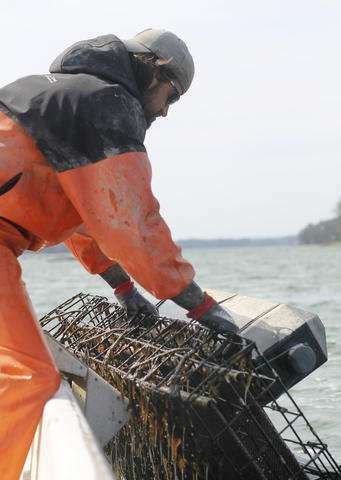 "Folks could capitalize on this opportunity to develop methods to grow scallops—which is a tremendously valuable industry in the wild—to get them past these dangerous stages and put them in the wild," he said. "There may be problems with lobsters; the jury's still out on that. But there may be ways to cultivate these lobsters until they're beyond the stage at which they'd be threatened by ocean acidification." In Maine, a legislative panel voted down the creation of an "Ocean Acidification Council" about a month ago, but supporters say they will form an organization on their own. And Mook said that while it was tempting to keep his methods of boosting production to himself, he wants to share what he's learned in hopes of helping the broader industry. "I think right now, my biggest priority is to convince people who hold the purse strings to fund monitoring, and some research," he said. "Setting up a monitoring system here along the Maine coast, I view as infrastructure project. It basically is no different than putting street lights up in a dark part of the city so that we, the oyster growers and shellfish farmers and the wild harvesters, can see what dangers are lurking in the alleyways."